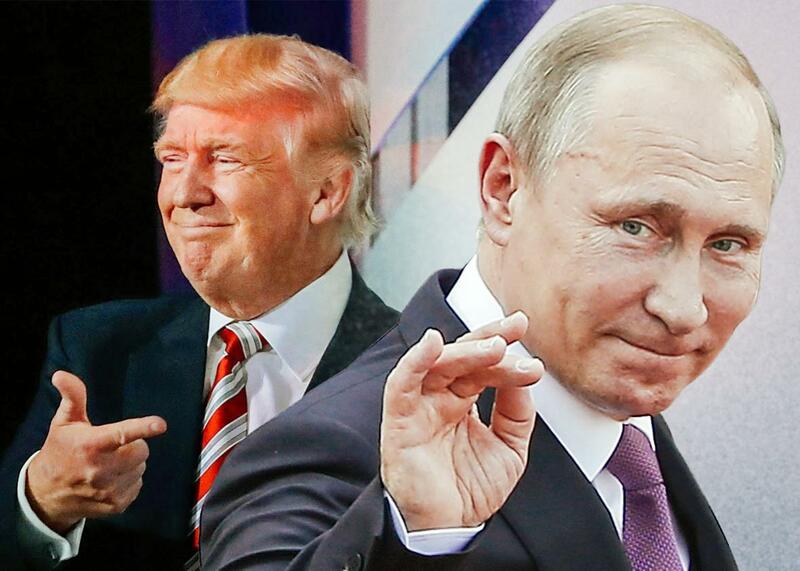 Why Donald Trump loves Vladimir Putin. They swim together in the white nationalist fever swamps. Of all the world’s authoritarians, Donald Trump’s favorite may be Vladimir Putin. Photo illustration by Slate. Photos by Chip Somodevilla/Getty Images, Lintao Zhang/Getty Images. But of all the world’s authoritarians, Trump has had the most to say about Vladimir Putin, whom he respects as a strong leader. Stronger, in fact, than President Obama. “I’ve already said, he is really very much of a leader. I mean, you can say, oh, isn’t that a terrible thing—the man has very strong control over a country,” said Trump this week at NBC News’ forum on national security. “Now, it’s a very different system, and I don’t happen to like the system. But certainly, in that system, he’s been a leader, far more than our president has been a leader.” (It is worth a moment here to say that, by any reasonable measure, Putin has been a failure for Russia, which is mired in international conflicts, struggling with a stagnant, failing economy; repression; and corruption.). We don’t have a firm answer to why Trump is so taken with authoritarians. At most, we know that he is preoccupied with dominance and “strength,” is obsessed with opulence and projected wealth, and sees life as a contest defined by “winners” and “losers.” But this edges into speculation and amateur psychoanalysis. What we can say for certain is that Trump’s personal admiration for Putin, at least, sits side by side with his material ties to Putin and assorted Russian oligarchs, from former campaign manager Paul Manafort—who worked to elect a Putin ally in Ukraine—to the strong evidence that Trump’s businesses received substantial funding from Russian elites. From there, it is just a short step to the more aggressive Trump campaign admiration of Putin, especially with Trump’s relationship to white nationalism. Trump and his team swim in the fever swamps of the racist right. Trump’s “campaign CEO,” Stephen Bannon, ran a website that acts as a haven for the youngest generation of white supremacists. Trump’s oldest son, Donald Trump Jr., often tweets and retweets voices from the conspiratorial and white nationalist right, voicing a hard line on undocumented immigrants and the Muslim ban. When you place Trump and his long admiration for authoritarian leaders into the current of modern-day white nationalism and far-right thinking, you end up with what we’ve seen from his campaign—outright praise for a figure who siphons national resources for personal gain, jails dissidents, and is linked to the murder of journalists. Trump’s praise for Putin raises important questions about what, exactly, the Republican presidential nominee means when he says “Make America Great Again.” Under Vladimir Putin, Russia has slid toward right-wing autocracy, with crackdowns on key political liberties. In recent years, Putin’s eye has turned toward ethnic and religious minorities—as well as the Russian LGBTQ community—as a scapegoat for declining economic fortunes and unsuccessful wars. With Trump’s attacks on immigrants and Muslims, his belligerence, and his long history of poor management and aggressive scapegoating, it seems that this is what we can look forward to under a Trump administration: a “great” America, under a new regime of kleptocratic authoritarian nationalism.